Japanese Episode AG 180: "Miraculous! The Mountain of the Giant Kekking!!" 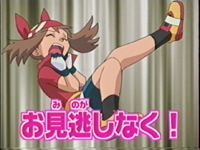 American Episode 450: "Slaking Kong"
Eh...this episode is ok, I guess. I mean, there really isn't anything that stands out as being particularly bad, but there also isn't anything that's really that good either. As far as transition episodes go, I thought that "The Ribbon Cup Caper" was a better episode, but this one wasn't that bad either. In the dub version, Yama no Kami-sama ("the god of the mountain") has been changed to "king of the mountain." I guess references to deities are still confined to old fishermen and lady's men, huh? Taylor's voice was pretty bad, but he's such a nothing character that it doesn't really matter anyway. Aipom keeps its Japanese voice. Pokémon Symphonic Medley, the most overused vocal song this side of Ready Go!, can be heard in the Japanese version from the point after the Rocket-Dan's mecha is defeated until the end of the episode. In the dub, this is all replaced. Hey, at least it's not Pokémon Symphonic Medley for the 100th time.